General Sir John Monash, Commander of the Australian Corps, planned for an attack to dislodge the German position on a spur of high ground where the Australian Corps Memorial Park and granite memorial now stands. The frontage of the attack was about 3 miles wide from Villers-Bretonneux village in the south to Le Hamel in the north, with Vaire and Le Hamel woods between these villages. Monash prepared the Australians' offensive to be one of complete surprise to the Germans. It was to be the first modern battle where the combined arms of infantry, tanks, artilery and air support would fight successfully together. Aircraft of the Royal Flying Corps and the Australian Flying Corps were used by Monash in this battle to resupply the ground troops with ammunition dropped by parachute. The aircraft also bombed craters in the open ground ahead of the assaulting infantry to give them some cover in the craters as they advanced. They flew constantly during the night of 3 July over the German trenches to disguise the noise from the tanks as they moved up to the front to form up for their attack. 1,000 American troops were designated to be attached to the Australian Corps for the battle. General Monash selected the date of the attack as 4 July as American Independence Day for the date of the attack in honour of the American involvement in this battle. At 3.02am the artillery fired a smoke screen for the Australian and American infantrymen. This was the end of a series of artillery bombardments of smoke and gas during the build-up to the attack. The gas shells had compelled the Germans to repeatedly put on their gas masks. With the smoke screen at 3.02am they also assumed that it would be a bombardment with gas shells too, and many put on their gas masks. At 3.10am the artillery started up a creeping barrage for four minutes. At precisely 3.14am, just as dawn was beginning to break, the Australian battalions left their trenches, following behind the barrage. They advanced towards the German Front Line. A German trench called Pear Trench on the British Army maps put up a tough defence. The advancing infantry had a difficult fight in the village of Le Hamel. The attack was a great success, with the objectives reached by the Australian Corps by 04.35am, exactly 93 minutes from the start of the artillery smoke screen at 3.02am. German casualties numbered about 2,000, with another 1,600 taken prisoner. Australian casualties were about 1,400 of whom about 250 were killed. 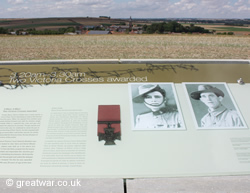 Information panel at the Australian Corps Memorial, looking west towards Le Hamel village. Private Henry (Harry) Dalziel was in action with a Lewis machine gun in front of Pear Trench in the early hours of 4 July 1918. At the age of 25 he was awarded the Victoria Cross for his actions on that day. “For most conspicuous bravery and devotion to duty when in action with a Lewis gun section. His company met with determined resistance from a strong point which was strongly garrisoned, manned by numerous machine guns, and undamaged by our artillery fire, was also protected by strong wire entanglements. A heavy concentration of machinegun fire caused many casualties, and held up our advance. His Lewis gun having come into action and silenced enemy guns in one direction, an enemy gun opened fire from another direction. Private Dalziel dashed at it, and with his revolver killed or captured the entire crew and gun, and allowed our advance to continue. He was severely wounded in the hand, but carried on and took part in the capture of the final objective. Lance Corporal Thomas (Jack) Axford, MM, was awarded the Victoria Cross for his action in the task of clearing Vaire and Hamel Woods of the German defenders. He enabled a platoon which was being held up by German machine gunners to move forward again. Single-handedly he got into the German trench and took the machine gunners on. He killed 10 of them and six were taken prisoner by his battalion. Lance Corporal Axford was 24 years old. “For most conspicuous bravery and initiative during operations. When the barrage lifted and the Infantry advance commenced, his platoon was able to reach the first enemy defences through gaps which had been cut in the wire. The adjoining platoon being delayed in un-cut wire, enemy machine guns got into action, and inflicted many casualties, including the Company Commander. Lance-Corporal Axford, with great initiative and magnificent courage, at once dashed to the flank, threw his bombs amongst the machine-gun crews, jumped into the trench, and charged with his bayonet. Unaided he killed ten of the enemy and took six prisoners: he threw the machine guns over the parapet, and called out to the delayed platoon to come on. He then rejoined his own platoon, and fought with it during the remainder of the operations. Australian Corps Memorial at Le Hamel on the July 1918 Somme battlefield. 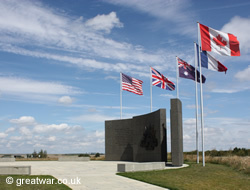 A memorial to the Australian Corps is located on the site of the final objective of the Battle of Le Hamel on 4 July 1918. The memorial affords views of the landscape where the battle was fought. A series of information panels describe the location and what happened there. (1) Supplement to the London Gazette, 17 August 1918, page 9660. (2) Supplement to the London Gazette, 17 August 1918, page 9660.